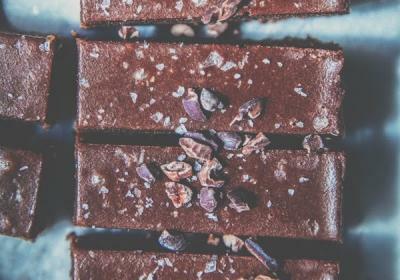 Arguably the most important food group on a raw vegan diet: CHOCOLATE. *wink wink* Test out our favorite recipes here! Warning: don't have these when you're super hungry because you will want to eat more than one! They're perfect with a glass of cold almond milk after a meal. These delicious brownies by Emily Von Euw of This Rawsome Vegan Life come infused with a little therapeutic greenery: broad spectrum CBD from hemp which has a host of health benefits e.g. it acts as an adaptogen, helps regulate mood and sleep, and helps support healthy nerve function. When you leave out the sugar in raw chocolate you get to experience the sharper, spicier tones of cacao. You can also dress it up with a variety of savory and sweet flavors (sans the actual sugar) to give the taste buds (and the body) a treat - things like medicinal mushrooms, flaked sea salt, real vanilla bean, lucuma, mesquite, or tahini. 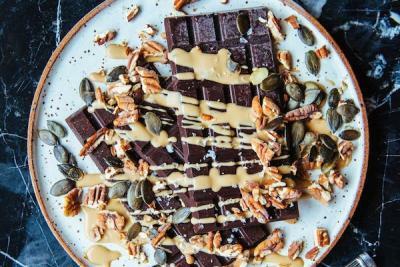 This recipe by Emily Von Euw of This Rawsome Vegan Life is a winner, and perfect for those of us who like to take it easy on the sugar.